Nguyen Van Tu asks if I’m serious. 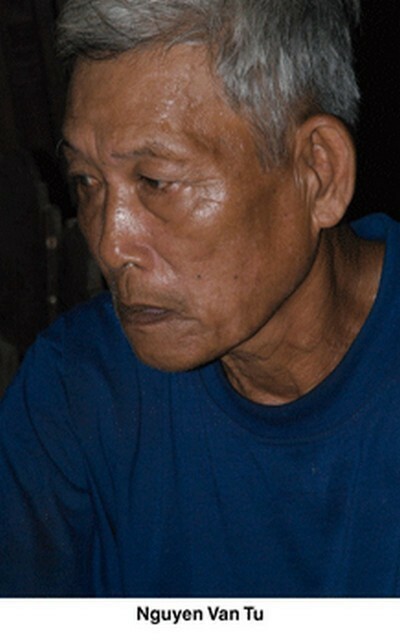 Am I really willing to tell his story — to tell the story of the Vietnamese who live in this rural corner of the Mekong Delta? It’s 2008. Forty years after guerrilla fighters in his country threw the limits of U.S. military power into stark relief — during the 1968 Tet Offensive — we sit in his rustic home, built of wood and thatch with an earthen floor, and speak of two hallmarks of that power — ignorance and lack of accountability. As awkward chicks scurry past my feet, I have the sickening feeling that, in decades to come, far too many Iraqis and Afghans will have similar stories to tell. Similar memories of American troops. Similar accounts of air strikes and artillery bombardments. Nightmare knowledge of what “America” means to far too many outside the United States. “Do you really want to publicize this thing?” Nguyen asks. “Do you really dare tell everyone about all the losses and sufferings of the Vietnamese people here?” I assure this well-weathered 60-year old grandfather that that’s just why I’ve come to Vietnam for the third time in three years. I tell him I have every intention of reporting what he’s told me — decades-old memories of daily artillery shelling, of near constant air attacks, of farming families forced to live in their fields because of the constant bombardment of their homes, of women and children killed by bombs, of going hungry because U.S. troops and allied South Vietnamese forces confiscated their rice, lest it be used to feed guerrillas. After hearing of the many horrors he endured, I hesitantly ask him about the greatest hardship he lived through during what’s appropriately known here as the American War. I expect him to mention his brother, a simple farmer shot dead by America’s South Vietnamese allies in the early years of the war, when the United States was engaged primarily in an “advisory” role. They made it to safety. He didn’t. The 105-millimeter artillery shell that landed near him ripped off most of his right leg. 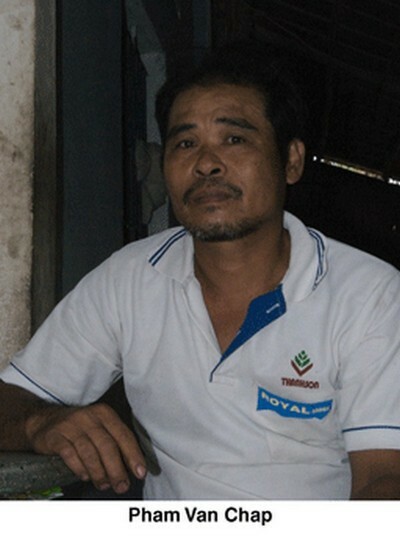 Elsewhere in the Mekong Delta, Pham Van Chap, a solidly-built 52-year-old with jet-black hair tells a similar story. His was a farming family, but the lands they worked and lived on were regularly blasted by U.S. ordnance. In January 1973, the first month of the last year U.S. troops fought in Vietnam, Pham heard the ubiquitous sound of artillery and started to run to safety. It was too late. A 105-millimeter shell slammed into the earth four meters in front of him, propelling razor-sharp shrapnel into both legs. When he awoke in the hospital, one leg was gone from the thigh down. After 40 days in the hospital, he was sent home, but he didn’t get his first prosthetic leg until the 1990s. His new replacement is now eight years old and a far cry from the advanced, computerized prostheses and carbon fiber and titanium artificial legs that wounded U.S. veterans of America’s latest wars get. 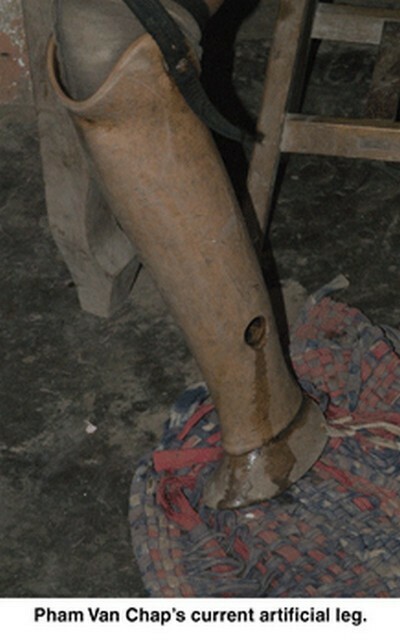 His wooden prosthetic instead resembles a table leg with a hoof at the bottom. “It has not been easy for me without my leg,” he confides. Not even an apology. His request is entirely too reasonable. He simply asks for a new leg. Nothing more. I wish I could answer, “Yes.” Instead, I tell him that most Americans are totally ignorant of the pain of the Vietnamese people, and then I think to myself, as I glance at the ample pile of tiny, local potatoes on his floor, about widespread American indifference to civilians killed, maimed or suffering in other ways in Iraq and Afghanistan. Even those Vietnamese who didn’t lose a limb — or a loved one — carry memories of years of anguish, grief, and terror from the American War. The fall-out here is still palpable. The elderly woman who tells me how her home was destroyed by an incendiary bomb. The people who speak of utter devastation — of villages laid waste by shelling and bombing, of gardens and orchards decimated by chemical defoliants. The older woman who, with trepidation, peeks into a home where I’m interviewing — she hasn’t seen a Caucasian since the war — and is visibly unnerved by the memories I conjure up. Another begins trembling upon hearing that the Americans have arrived again, fearing she might be taken away, as her son was almost 40 years earlier. The people with memories of heavily armed American patrols disrupting their lives, searching their homes, killing their livestock. The people for whom English was only one phrase, the one they all seem to remember. “V.C., V.C.” — slang for the pejorative term “Viet Cong” — and those who recall model names and official designations of U.S. weaponry of the era, from bombs to rifles, as intimately as Americans today know their sports and celebrities. I wish I could tell Nguyen Van Tu that most Americans know something of his country’s torture and torment during the war. I wish I could tell him that most Americans care. I wish I could tell him that Americans feel true remorse for the terror visited upon the Vietnamese in their name, or that an apology is forthcoming and reparations on their way. But then I’d be lying. Mercifully, he doesn’t quiz me as I’ve quizzed him for the better part of an hour. He doesn’t ask how Americans can be so ignorant or hard-hearted, how they could allow their country to repeatedly invade other nations and leave them littered with corpses and filled with shattered families, lives, and dreams. Instead he answers calmly and methodically. Nguyen Van Tu grasps my hands in thanks as we end the interview. His story is part of a hidden, if not forbidden, history that few in the U.S. know. It’s a story that was written in blood in Vietnam, Cambodia and Laos during the 1960s and ’70s and now is being rewritten in Afghanistan and Iraq. It’s a story to which new episodes are added each day that U.S. forces roll armored vehicles down other people’s streets, kick down other people’s doors, carry out attacks in other people’s neighborhoods and occupy other people’s countries. Nick Turse is the managing editor of TomDispatch and a fellow at the Nation Institute. His latest book is Next Time They’ll Come to Count the Dead: War and Survival in South Sudan. He is also the author, among other works, of the award-winning, bestselling Kill Anything that Moves: The Real American War in Vietnam. His Website is NickTurse.com. Tam Turse is a freelance photographer. This story originally appeared at TomDispatch.